The HTC One comes with a brand new Snapdragon 600 chipset, which is the first to offer four 1.7GHz Krait CPU cores and we were pretty curious to find how much of a performance boost it brings. To be honest we were taken by surprise by the HTC One processing prowess. We did expect it to deliver some of the best performance out there, but some of the scores were simply amazing. 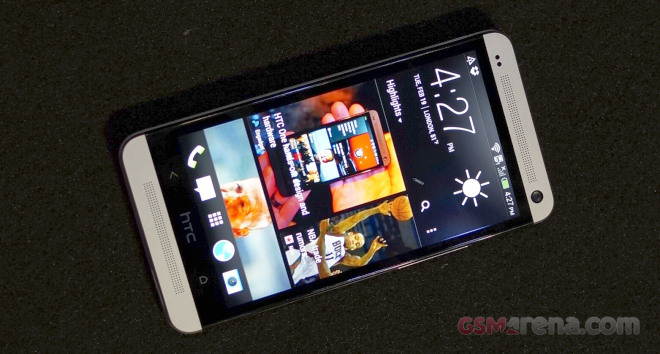 The BenchmarkPi score that the HTC One posted made us want to pinch ourselves. The smartphone topped the previous best result (courtesy of Sony Xperia Z) by more than 100ms. The HTC One also took the first place in the multi-threaded Linpack test, although the margin of its victory wasn’t as big here. The all-in-one Quadrant and AnTuTu benchmark scores were as impressive as it gets – HTC One continued its clean sweep, comfortably beating the other devices we have tested so far. We also run some browser test with the stock web browser – the HTC One took the second place in the BrowserMark 2 test, while a few phones turned out to be better on the Java-script SunSpider benchmark. Obviously HTC still needs to work on optimizing its browser, but even so the performance is close to the best out there. It seems the HTC One and the Snapdragon 600 platform are the new Benchmark champion, topping even the just released Xperia Z flagship. If raw power is what you are after, this should be the smartphone to look forward to.